On his first obstacle of the day, A4, Craig Zellar breaks a driveline to bring us the first carnage of the competition. His brother, Bruce "BZ" Zellar follows this up with a roll on A1 while , insert name, in vehicle 35 also takes out a driveshaft. Course A4 is, as always, the bear of the comp and competitors are killing themselves to just finish. With 40's going to the first several competitors, it's looking like L'il Rich's sick mind has had a chance to flex its muscle. Competitors on all courses are fighting to get through and the scores are reflecting this with plenty of high numbers all around. 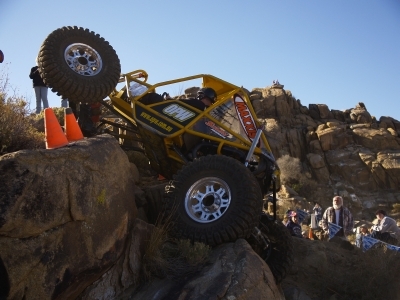 The action continues as teams are crawling and clawing their way through the courses. Hammer is on the mic and giving the crowd the info they crave. The crowd has come out in a good showing and are milling around, picking out teams to follow and cheering on anyone that happens to be in front of them. teams are also taking time to sign just abouot anything for the fans in the pits. The day started off with the sound of metal crunching as team after team found themselves on their sides and lids. B4, nicknamed "Landslide" due to how it was built, has claimed the fuel cell of DesertFab's buggy after a hard roll just before the exit. B3 is also claiming vehicles in its clutches as 3 vehicles have already shown the crowd their bellies. Nicole Johnson went turtle on her first obstacle, B1, and had to be extraced from the obstacle. But the excitement of the morning goes to Matt Messer on B2 as he flopped to his side just before the finish, was able to right himself and then flopped again as he went through the exit gate with only 3 seconds left on the clock. With all of that excitement, he still finished with an extremely low score of 1. Recovery seems to be the name of the day. Several vehicles have been nursing their bruises from Saturday and those contusions are becomeing bloody gashes today. Case in point is Peter Antunac who's aussie-built rig is running nothing short of a diaper on the rear steer after ripping the ram off the axle yesterday. His only comment about this condition is that it's going to save him 25 points today if he gets to run all five possible obstacles. With a commanding 22 point lead so far today, that objective is very obtainable. Wow. That is all that can be said of BZ's performance on B2 just now. After announcing to the crowd that he's "too far down" in points and was just going for the show value. Upon completion of a run that netted him -22 points where the next closest was -3, he's now sitting in 5th place. In an after-course interview, he's now called out Tracy Jordan with "The gaunlet's been thrown." Nicole Johnson on B2 gets the excitment higher by getting wedged on course B2 with only 30 seconds to go. Her response to the judge's call was to hammer down and part the crowds as she came flying out of the finish with 4 seconds remaining on the clock. Her tally came up to a 2 for the course. The sibling rivalry has been going on all weekend between Craig and Bruce Zeller, but BZ's actions on B2 have quieted that one as BZ jumped to 4th, leaving Craig down in 9th place. Tracy Jordan on B2 also had a great time getting "more twisted than any vehicle I've ever seen" (Lil' Rich) and coming out with a -19 to get the crowd roaring yet again. 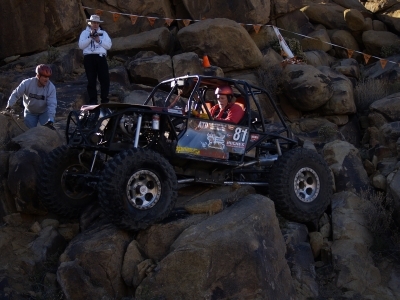 Mike Hulinsky, driving the Rhino RTV, pulled the most amazing skills on B2 finishing the course that some more extreme rigs couldn't finish with a measly 2 points. Looks like B2 was the course of change for many teams, as it made or broke them in the rankings. Lil' Rich has gone out to setup the Shootout course, which promises to be one of the sickest seen by any competitor, ever. As you can see, there is room to move around in a few spots and it's assured they will. With the reverse running order entering the course, Dean Bullock will be forced to find the lines first. With his shorter wheelbase and the sick lines of the course, this should get interesting. Bill Kreisel's tractor-looking rig has the wheelbase, but does he have too high of a center of gravity on the off camber lines? BZ's lack of rear steer could hurt him for the tighter sections, but his low center and smooth style may help overcome. Robert McKenney and his Campbell-built rig (at least that's what the stickers say) looks to have the moon buggy approach similar to BZ. With the close scores between the two, could we end up with similar scores? 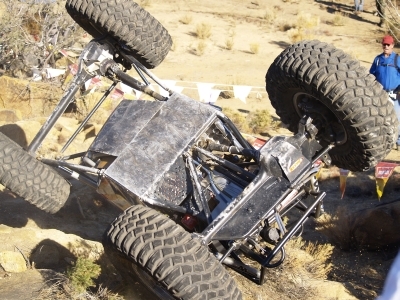 Peter Antunac, the Aussie, and his oddball active suspension and severely damaged rear steer moon buggy may prove to be the type of vehicle on this course. However, his almost lack of something, rear steer, that he's so used to may hurt him on this last course. As it turned out, the course can be completed in the negative, and it was BZ's driving skills with George Poston's guns in full flex that got them through with an amazing score of -8. Dean Bullock's run didn't go nearly as well as he got hung up hard and finally would up driving down the hill and out the boundary with a score of 38 after getting through 2 gates and timing out. Bill "Billy Goat" Kreisel also made it through the course still on all fours, showing that he's still one of the best drivers out there by turning in an impressive score of 19 when the dust settled. Robert McKenney entered the shootout in 4th place but that didn't last. He had engine troubles at the start and those continued into the course. His final score was a 40 as he didn't make it through the first gate, but it wasn't for a lack of trying. Peter Antunac had upset after upset happen today, but only in the scores. His day was going very well even with a limping vehicle but he kept losing spots. Finally, he entered the shootout in 2nd place with 78 points. However, the final course was not kind to Peter as his rear axle suffered severe damage due to getting seriously wedged near the end. This damage included the broken steering arm and a broken one-off hydraulic shock, add this to his broken rear steering ram and you have one damaged vehicle. He wound up coming out in 3rd place with a final 37 points added to his overall total of 115.
tracy Jordan only needed to complete 1 progression gate to win the competition, but he went for it all. Near the end of the run, he got hung up in the same hole as Peter, but without a rear steer that has a mind of its own, he was able to get out and finish the course in plenty of time to get a final score on the obstacle of 11 to total him out at 76 for the competition.